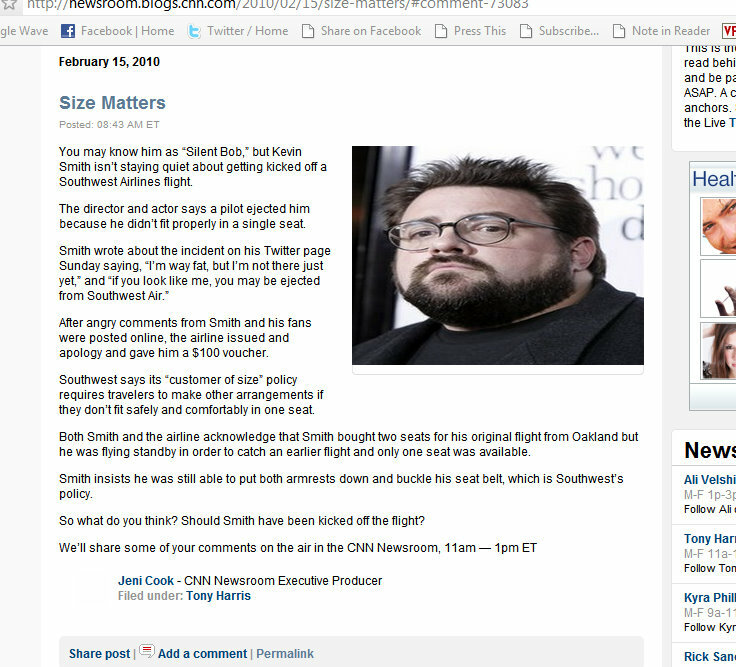 There was a bit of a brouhaha yesterday when Clerks director Kevin Smith was told by Southwest Airlines that he was too big to fly in a single seat. The details are available for anyone interested enough to type “kevin smith” and “southwest” into Google. However, I thought this was interesting. This morning, CNN’s newsroom blog posted an item on the issue, including a photo of Smith. Here is a screen capture of the page. Is it me, or does that photo of the admittedly portly Smith look like it’s been significantly stretched on the horizontal axis? Every course I’ve ever taken on journalism ethics has emphasized the idea that unduly manipulating photographs is verboten. Consider the case of the infamous TIME Magazine cover of O.J. Simpson’s mugshot, which was desaturated and otherwise altered, presumably to make Simpson appear more menacing. CNN’s post this morning might not be quite as odious as TIME’s gaffe, but it’s certainly a cheap attempt to make Smith look larger than he actually is. UPDATE: Looks like they’ve fixed it. Compare the current version with my screen capture. Photojournalism fail: That is so wrong. I see that they’ve fixed it and all, but once it’s published, it’s published, let alone on the World Wide Web. Good one, Ian. Good catch on their stretchy photo! Never mind ethics – couldn’t the publisher simply see the photo is stretched unnaturally?! Not that it matters to most people, a typo remains in the CNN post, “issued and [sic] apology.” I left a comment; doubt it will change things. It was very obviously stretched in the original post — so obvious that you don’t even need to see the original photo to be able to tell. It was either incredibly sloppy posting on the CNN blogger’s part, or it was done intentionally to make Smith look fatter than he actually is. But your “and” catch makes me think it could just be routine, pre-coffee carelessness. On the other hand… if it was intentional, making Smith look fatter weakens his case against Southwest — meaning CNN’s blogger was sneakily taking sides.